Diamond Jubilee Queen Elizabeth: TV coverage in America. Watching the Diamond Jubilee from the other side of the pond. 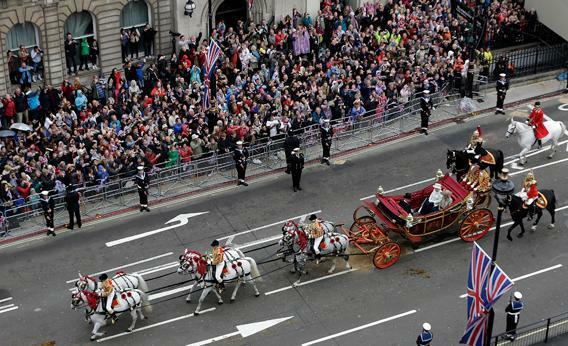 Queen Elizabeth II travels by carriage along Parliament Street on June 5, 2012 in London, England. Thousands of well-wishers from around the world have flocked to London to witness the spectacle of the weekend’s celebrations. Elizabethan Media Age (1952-). For the past several days, watching the celebration in London from the comfort of the couch, we’ve been anthropologists of Angles and Saxe-Coburg-Gothas, studying tribal behavior and codes of class. We’ve been pop astrologers admiring a celebrity phenomenon more rare than the Transit of Venus, and astronomers searching the film and video history of a culture where, heavens, it’s Moonraker, Jesus Christ Superstar, and the sparkle of Elton John’s fuchsia jacket transmitted by BSkyB. BBC America has been inundating its viewers with coverage like rain clouds inundating London, which is exactly what rain clouds have been doing. On CBS and ABC and Fox News, there was a frequent refrain from American hosts fretting that the rain would bother the queen. “The queen will be phlegmatic,” said Richard Quest on CNN. “And so are her subjects. We’ve been getting rained upon well and often.” I quite enjoyed the palpability of Quest’s excitement. At one point, when the weather was still merely a pleasant light grey, Piers Morgan had to beg him to stop taking pictures of the royal barge with his camera phone and concentrate on talking. This was during Sunday’s majestic boat show—a flotilla on the Thames. The 86-year-old monarch was on her feet for four hours reviewing the pageant from the desk of her royal barge. The BBC thought that, wearing white, she looked “like a pearl” amid all the gray.